John Kelly was the agent of a Norwich textiles manufacturer. 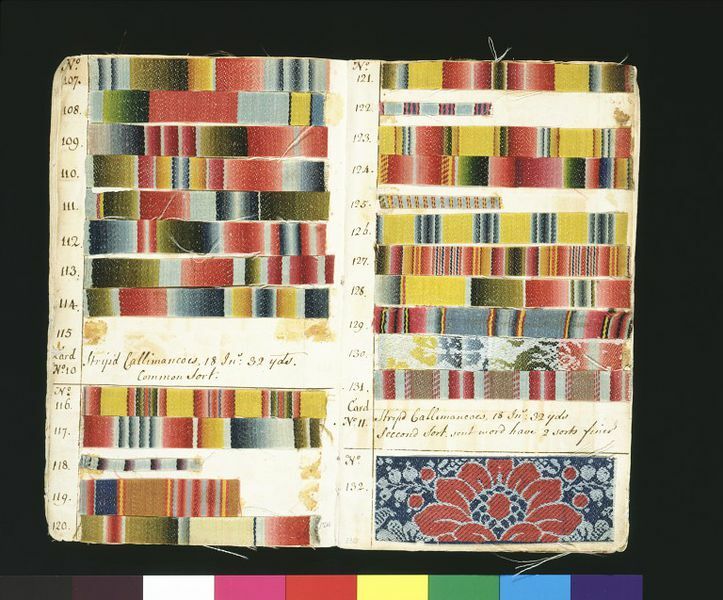 This book is his 'counter-part', or matching copy, of a pattern book sent to Portugal and Spain, where customers could choose from the numbered samples and have their orders prepared back in Norwich. The book shows the range of patterns and colours thought likely to appeal to the Spanish and Portuguese market in 1763, the date it was sent, and the colourful names given by manufacturers to convey fashionable or exotic novelty, like martinique, harlequin, floretta and diamantine. Worsted is a fabric woven from long staple wool, which is prepared for weaving by combing rather than carding, and can have a smooth finish suitable for glazing. In the second half of the 18th century, the majority of the worsteds exported were calimancoes. 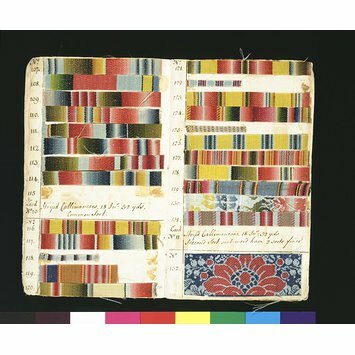 A contemporary writer commented that 'these were woven in various patterns which ... were composed of the richest and most brilliant dyes and variegated by an endless diversity of colours ... this manufacture was peculiar to Norwich, and the colours employed for it surpassed any others dyed in Europe'. British Customs records list large quantities of worsted sent to Spain and Portugal from Norwich in the 18th century. The export market was of major importance to Norwich textile manufacture. Norwich Stuffs, as they were known, were exported via London (and later Great Yarmouth), through Rotterdam, Hamburg and Danzig. There were substantial imports into Russia and China, and to the Iberian peninsula, from where they were also re-exported to Central and South America. The export market for worsted fabrics was very important to the English textile industry with 'stuffs' woven in Norwich sent to across Europe and to Asia and America. The most popular were calimancos, which were worsteds woven in stripes and floral patterns in bright colours with a glazed finish.